Ruijsink will switch jerseys for the Mosconi Cup. In a move that was met with mixed reviews, Mosconi Cup promoter Matchroom Sport announced Holland’s Johan Ruijsink as 2017 captain for Team USA. The 50-year-old Ruijsink is well known in Mosconi Cup annals as the undefeated captain for Team Europe, having led the squad seven times between 2006 and 2014. Ruijsink voluntarily stepped down as Team Europe after the 2014 event, in part citing the lack of a challenge in leading the European team. Ruijsink replaces Mark Wilson, who helmed the U.S. squad for three years, coming closest to victory in 2015, when the U.S. lost, 11-7. With Team USA posting just one win in the last 11 Mosconi Cups, Matchroom said it was seeking a game-changer to “revive America’s flagging fortunes,” even if it meant appointing a European coach. The announcement caught many American players and fans by surprise. Numerous posts on social media decried the decision as “an insult to the Americans,” while others applauded the selection as America’s “best chance” to become competitive again. “The reason to take on this job is quite obvious,” Ruijsink commented in the Matchroom release. “I am an authentic lover of the game and especially of the Mosconi Cup. In 25 years of coaching, the Mosconi Cup has proven to be by far the most exciting event in the world of pool. Ruijsink is credited with coaching Holland into a pool powerhouse, mentoring stars like Alex Lely, Niels Feijen and Rico Diks in the ’90s and early 2000s. In recent years, he has been coaching in Russia, developing a talented crop of players, including recent World Pool Series champion Ruslan Chinahov. “I think it’s good, since he was so huge for Europe’s team,” echoed Skyler Woodward, Team USA’s best player over the past two Mosconi Cups. According to Matchroom, Ruijsink will get to hand pick his five-player team, so long as each player is ranked in the top 10 in Mosconi Cup points in 2017. Additionally, Ruijsink plans to travel to the U.S. several times during the year to meet with and observe potential team members. Ruijsink’s first decision was selecting Archer as his vice-captian. With the announcement of the final “wildcard” selections by the opposing captains, the final rosters for Team USA and Team Europe are set with four weeks to go before the 23rd Mosconi Cup commences at the Alexandra Palace in London, Dec. 6-9. Team Europe captain Marcus Chamat handpicked reigning World 9-Ball Champion Albin Ouschan of Austria and England’s Darren Appleton, who will be making his eighth consecutive appearance, to join Holland’s Niels Feijen, Scotland’s Jayson Shaw and England’s Mark Gray. The three automatic berths on Team Europe were awarded to the points champion of the EuroTour (Feijen), the top European points earner on a World Events Rankings (Shaw), and the highest-ranked player on the Combined (Gray, who placed third behind already-qualified Shaw and Feijen). Feijen, Appleton and Ouschan also appeared for Team Europe in 2015. As is customary, the wildcard announcements were greeted by second-guessing in social media. American fans questioned Wilson’s selection of Bergman, ranked sixth on the U.S. points list, over fifth-place finisher Oscar Dominguez. (Morris finished fourth in points.) Given the fact that the 2015 squad was made up of the top five point-earners, and the fact that Bergman lives in southern Illinois, not far from Wilson’s St. Louis home, charges of favoritism and “politics” were bandied about as fans weighed in. “I don’t have a bias and I don’t give those claims any credence,” said Wilson. “I simply picked the team that I thought gave us the best chance of winning this year. I analyze things like late-season performance, strengths and weaknesses and how they fit in with the strengths and weaknesses of the rest of the team. The concept of a “wildcard” selection was even more pronounced in Chamat’s selection of Appleton for Team Europe. 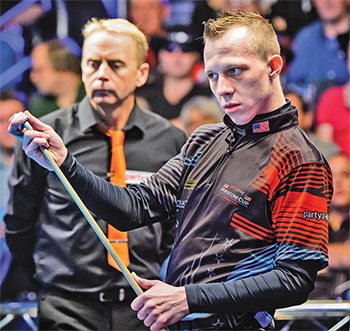 While the former World 9-Ball Champion has been a member of six Mosconi Cup-winning squads, Appleton suffered through a subpar 2016, failing to crack the top 10 in the European Combined points list. After making “some of the roughest telephone calls I’ve ever had to make,” Team USA captain Mark Wilson announced his five-man team for the 21st Mosconi Cup, scheduled for Dec. 1-4, in Blackpool, England. The squad features a mixture of veteran players and youth. 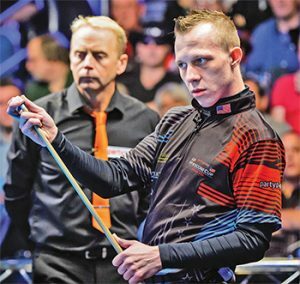 Not surprisingly, newly minted U.S. Open 9-Ball champion Shane Van Boening will lead the U.S. squad, which has dropped four Mosconi Cups in a row (and six of seven) to Team Europe. The 31-year-old Van Boening will play in his eighth Cup, and will be joined by Cup veterans Corey Deuel, also making his eighth appearance, and John Schmidt, who played in 2006 in Rotterdam. 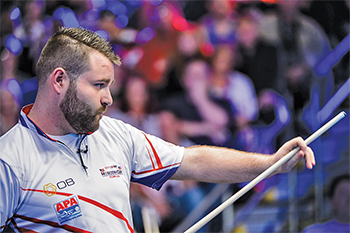 Making their Mosconi Cup debuts will be 27-year-old Justin Bergman of Fairview Heights, Ill., and 26-year-old Justin Hall of Palm Harbor, Fla. The “tough calls” Wilson made were to Brandon Shuff, Oscar Dominguez and Jeremy Sossei, who have been offered coaching positions in Blackpool. 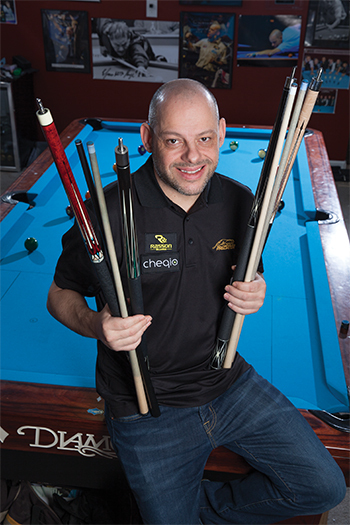 Dominguez and Shuff have each participated in one Mosconi Cup, with Dominguez being a member of the last U.S. team to win the title, in 2009. According to Wilson, the three players left off the final squad were asked to travel with the team to England, expense-paid, to assist during the event. “This won’t be a holiday,” Wilson added. “Each player will be assigned special duties, setting up little refresher drills for the team before each round.” Wilson said the duties include an Offensive Coordinator, a Defensive Coordinator (to work on safeties and kick shots) and Specialty Shots Coordinator (for breaking and elevated cue shots). 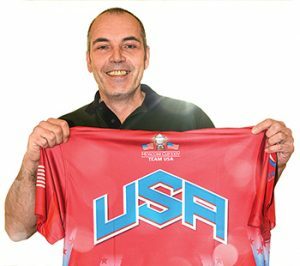 As was his original intent, Mosconi Cup Team USA Captain Mark Wilson worked quickly to select the players who will compete for the final five roster spots for the 2014 event in December in Blackpool, England. Wilson announced the selection of eight players who will train and compete together through the summer, before the captain whittles the list down to the five players who will wear the red, white and blue in Blackpool. Wilson also named seven-time Mosconi Cup veteran Corey Deuel, who many thought should have been on the team in 2013, to the squad. John Schmidt, Oscar Dominguez and Brandon Shuff, each of whom has participated in one Mosconi Cup, were named to the team was well. Leaning on America’s youth, Wilson rounded out his selection with Southern Classic One-Pocket champion Justin Bergman, Derby City titlist Justin Hall and Connecticut’s Jeremy Sossei. More interesting than who Wilson selected, of course, was the list of players who weren’t invited to “camp.” The most notable omission was Johnny Archer, whose string of 17 consecutive Mosconi Cup appearances will come to an end. Fourteen-time Cup participant Earl Strickland and nine-time team member Rodney Morris were also left off the roster. 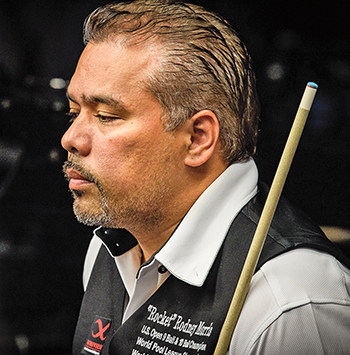 In fact, Van Boening will be the only holdover from the 2013 squad that lost 21-1 to Team Europe in Las Vegas. Another player conspicuous by his absence is Mike Dechaine, one of the most consistent American players over the past three years. Wilson added that his plan is to get the players together several times over the summer and fall for practice and team bonding. Wilson said he planned to make the final cut to five players after the U.S. Open, and that Team USA would meet and practice together for a week at Lindenwood University near St. Louis before departing for London. The dates of the 2014 Mosconi Cup are Dec. 1-4. The 2006 Billiard Congress of America Junior Nationals would’ve been a re-run of last year if it weren’t for the debut of Elizabeth Lovely, who dethroned the defending champion in her division to join the three other defending champions in the winners’ circle. 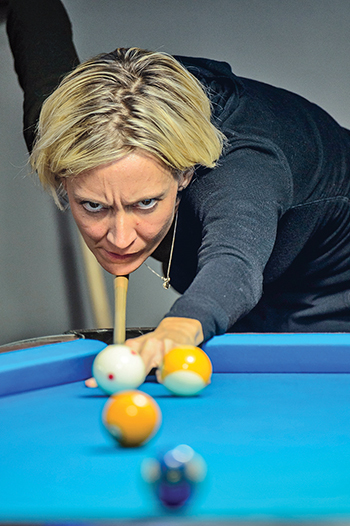 The 9-ball event brought 94 of the nation’s brightest young pool players to Tucson, Ariz., where they competed in divisions of 14 and under and 19 and under. In the 14 and Under Girls division, Lovely of Centerville, Ohio faced defending champion Chelsea Hardwick from Evansville, Ind. in the final. Both players felt the pressure to perform and the match was marred by nerves. Lovely took an early 2-0 lead, but Hardwick came back to take the lead at 3-2. 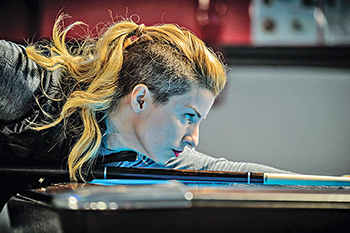 That third game would be the last that Hardwick won as Lovely took the next three racks for the 5-3 victory and her first Junior Nationals title. At age 13, Austin Murphy from Folson, Calif. has accolades well beyond his years including the 2005 Junior Nationals title and a spot on the International Pool Tour. Now he can add two-time winner of the Jr. Nationals, defending his title In the 14 and under Boy’s division. Murphy cruised through the winners’ side to meet Ryan Dunn from Hillsboro, Tenn. in the final. 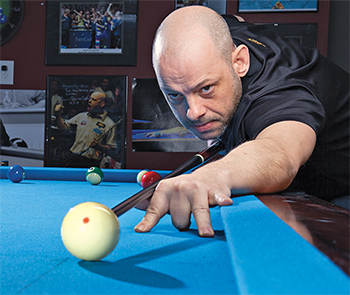 Murphy was cool and confident, controlling the table to the tune of a quick 4-0 lead. It was looking bleak for Dunn until Murphy finally made a mistake in the fifth rack and Dunn capitalized, getting on the scoreboard, 4-1. Murphy continued to commit uncharacteristic errors and Dunn caught up 5-5. He had the chance to sprint ahead and get to the hill first, but Dunn missed a 2-9 combo with the crowd on the edge of its seat. Murphy came back and ran the table to make the score 6-5. Dunn had another opportunity to reach the hill in rack 12, running his way through some difficult shots but a miss on the 6 marked his end as Murphy ran the last three balls to defend his 14 & Under Boys Title. While both 14 & Under Division Matches were close until the end, the 19 & Under Division Matches were very one sided. The 19 and Under Girls division saw defending champion Anna Kostanian from Albuquerque, N.M. take on 2004 Champion Mary Rakin from Daly City, Calif. The competition looked even at first, with the score tied at 1-1, but Kostanian commanded the table and pounced on every miss from Rakin on her way to a 6-1 lead in the race-to-7 match. Rakin saw a short reprieve in the eighth rack as Kostanian missed the case 9-ball, but the match end after a Konstanian won a short safety battle and ran out for the 7-2 win. In his 18 years, Justin Bergman of Fairview, Ill. has become a force to be reckoned with by players of any age. As defending champion of the Boys 19 and Under division, it didn’t look like he was going to allow Chad Palmer of Battle Creek, Mich., to come even one game closer to his title in the final. Bergman’s game was near flawless as he cruised to an 8-0 lead and kept Palmer grounded in his chair for the majority of the match. Palmer put together a nice runout in game 9 after a Bergman miss but a foul on the one ball in game 10 would be his end as Bergman confidently ran out the final rack for the 9-1 win. The 2006 BCA Junior Nationals got under way on July 5 at the University of Arizona student union with a total of 97 hopefuls in four divisions. The 18 & Under Boys Division has wooed back last year’s winner, 18-year-old Justin Bergman, who also won in 2003. In his last year of eligibility, he hopes to take home his third title with a repeat performance. Last year’s third-place finisher, Kevin Peterson, is anxious to decorate his trophy stand, however. He and Bergman will face off today, July 6. There is also an impeachment campaign for the returning champion in the 14 & Under Boys Division. International Pool Tour player Austin Murphy, 13, is back and so is last year’s runner up Landon Shuffett. Shuffett dropped a match on Wednesday, but Murphy has dominated all of his matches so far in the event. The 18 & Under Girls Division has a field of six players. Anna Kostanian won in 2005, after two years of runner-up finishes. She looked to be en route to a second straight title on the first day of play, going undefeated. 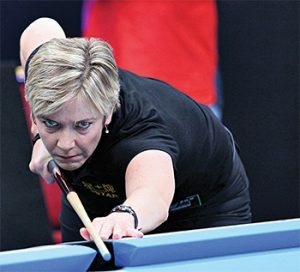 The 2004 champion, Mary Rakin will serve as the last line of defense in their hot-seat match today. The 14 & Under Girls Division also has a returning champion as Chelsea Hardwick looks for another title win in her division. The Riviera Hotel and Casino in fabulous Las Vegas, Nev., was filled with 227 bright blue, brand new Diamond tables and some 7,000 amateurs ranging in skill from recreational to Grand Master, and coming from as far as Tonga to compete in the 30th annual BCA Pool League National 8-Ball Championships, May 12-20. Teams “Slightly Competitive” and “Strategeary” did Denver, Colo. proud, taking home their division titles. “Slightly Competitive” topped the 17-team field in the Women’s Master division, toppling the California CueTees in the final for the second year in a row. Slightly Competitive consisted of Bonnie Plowman, Julie Schultz, Samm Diep, Katrina Games and Chris Honeman. Team “Strategeary” outlasted all of the 695 five-man teams in the Men’s Open division, made up of Billiard Digest’s own Tom Ross, Scott Tollefson, Bob Winters, Bob Keller, and Chizolm Woodson. In the most formidable field of the tournament, the Men’s Master Team division saw the Young Guns of St. Louis, Miss. take top honors, after besting the British dream team, Team Manston, made up of Men’s Master Singles winner, Michael Hill, and Men’s Grand Master Singles champion, Darren Appleton. All six members are highly decorated in their homeland game of British “reds and yellows.” The Young Guns have ample trophy cases as well, with four-time Missouri State champion Andy Quinn, Ozark Mountain champion Joe Woolford, two-time NCAA chamption Lars Varderman, Chuck Ralston, and the young gun of Young Guns, 18-year-old Justin Bergman, a former Junior National champion. The Women’s Open champions, the Las Vegas CueTees, didn’t have to travel far to set forth on their undefeated streak through the 119-team field. Members Norma Deitz, Summer Anderson, Karen Arthur, Pam Fletcher and Sarah Chatterjee credit their team mascots, “Spot” the turtle and “Aces” the river rat, for their win. In the singles tournaments, Lauren Ward of Los Angeles won the Women’s Open, beating Caroline Pao, who went on to win the Open Scotch Doubles tournament with partner William Rueben. In the Women’s Master Division, Rebecca Wagner, who has recently moved from Chicago to Las Vegas, beat her teammate and Chicago native Amy Latzko, who took first in the Master Scotch Doubles with partner Ike Runnels. In the Women’s Grand Master division, Tammy Jones of Dallas, Tex. defeated a familiar opponent in the final, Pamela Patton of Milwaukee, Wisc. While friends and Englishmen Hill and Appleton swept the Grand Master and Master divisions for the men, Derek Cumm, a mailman in Buelah, Ariz., delivered in the Men’s Open final against Bergman, winning, 5-1. 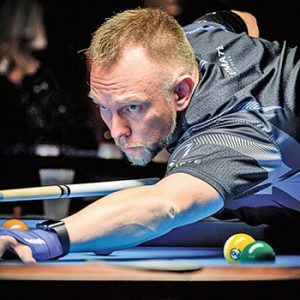 In this, the 30th year of the BCA Pool Leage National Championships, over 7,100 players entered, and took home $92,250 more in prize money than the previous year.